When the USA sends surfing athletes to the Tokyo Olympic Games in 2020 they will be there under the coaching leadership of 1984 Pipeline Master and founder of the Professional Surfing Association of America Pastor Joey Buran. “One thing all successful Olympic gold-medal coaches prioritize is their coaching staff. To achieve success, you must surround yourself with the best, and these coaches are a formidable force for Team USA surfing as it prepares to win medals at the 2020 Tokyo Olympics,” Buran said. Good on him. For the official word on Mr. Buran and the rest of his coaching team from the “National Governing Body for surfing in the United States” please follow the jump. 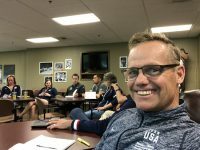 San Clemente, California (May 3, 2018) – Fresh off a meeting of the top minds in Olympic coaching, USA Surfing head coach Joey Buran announced Team USA’s coaching staff. “One thing all successful Olympic gold-medal coaches prioritize is their coaching staff. To achieve success, you must surround yourself with the best, and these coaches are a formidable force for Team USA surfing as it prepares to win medals at the 2020 Tokyo Olympics,” Buran said. Buran named WSL coach Chris Gallagher as Team USA’s elite technical coach to focus on analyzing surf athletes’ technique and heat strategy. Gallagher, a native of Northern California and a former Championship Tour surfer, has coached standouts like Jordy Smith and C.J. and Damien Hobgood. Additionally, Brandon Phillips will continue as an assistant coach focused on stoking the growing pipeline of young talent. Phillips has been invaluable to Buran in communicating high expectations and a sense of team among the youngest surfers. Buran, a Pipe Master’s champion and founder of the Professional Surfing Association of America, was recognized as one of the top Olympic coaches in the nation selected to participate in the elite United States Olympic Committee’s (USOC) National Team Coach Leadership Education Program. Buran said the USOC elite coaching program experience of working with Olympic gold-medal coaches and coaches like Joe Gibbs with his winningest racing empire comes at a critical time for Team USA surfing. “This is surfing’s Olympic debut. There isn’t a precedent, so I’m soaking up all the wisdom and experience of those who’ve been there and won gold and am applying it to Team USA surfing’s program to bring our winning streak to the Olympic stage,” Buran said. USA Surfing is the National Governing Body for surfing in the United States, recognized by the International Surfing Association (ISA) and the United States Olympic Committee (USOC). USA Surfing’s mission is to promote and grow the sport of surfing and support United States athletes of all backgrounds to achieve sustained competitive excellence in Olympic, Paralympic, Pan American and Parapan American competition. USA Surfing will oversee and support America’s Olympic team as surfing makes its debut in the 2020 Tokyo Olympics, and surfing and stand up paddleboarding athletes compete in the 2019 Pan American Games.